The multi-purpose Blue Cross Arena situated in Rochester, New York has dedicated December 2013 to sports. Rochester Americans, Rochester Razorsharks and Rochester Lancers are currently playing at the Arena. 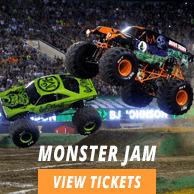 Get Blue Cross Arena tickets to enjoy your favorite sport. The arena was constructed on a downtown site that was surrounded by Court Street on the south, the Genesee River on the east, Exchange Boulevard on the west and East Broad Street on the north. The arena initially opened under the name of Rochester Community War Memorial in 1955, designed by the architect Leonard A. Waasdorp. It was renovated in mid 1990s to expand the arena. The renovation was worth $41 million. The expansion plan included larger capacity seating, increased concession stands, luxury suites, additional restrooms and fully functional banquet/meeting rooms. It reopened in 1998 as The Blue Cross Arena at the War Memorial. It now has a seating capacity of 13,000(11,200 for hockey and lacrosse). It has bars and restaurants as well: Dinosaur Bar-B-Que, Lorraine's Food Factory and Nathaniel's Pub. Formerly, the property of the arena was home of the Kimball Tobacco Co. At the time of opening in 1955, the arena had an exhibition hall that was located in the basement and a full stage on the south end. When the renovations were done, the permanent stage at the south end of the building was eliminated. The project was completed as Architects of Record by DeWolff Partnership Architects. Rossetti Architects worked on it in the capacity of consultants. Collaboration on the features of the design was done by Design Associates: Geno Rossetti (Rossetti Architects) and C.E. DeWolff (Senior Partner of DeWolff Partnership). The arena is known to host majorly concerts, sports events and family events along with other events. In addition to these, a wide variety of entertainment events are conducted at the arena such as ice shows and circus. It hosted NBA All Star Game in 1956. Led Zeplin played at the arena in 1971, Bob Dylan in 1975 and Elvis Presley graced the venue in 1976 and 1977. Taylor Swift performed at the arena as part of her 'Speak Now World Tour', for the first time in her career in 2011. Public show featuring famous Rochester based companies such as Eastman Kodak, Bausch & Lomb and Rochester Products was conducted at the venue. The arena is home to the Rochester Sports Teams (Rochester Americans-AHL, Rochester Razorsharks-PBL, Rochester Knighthawks-NLL and Rochester Lancers-MISL). Dave Cottenie (Stadium Journey Special) describes in his official review that the arena has gone under renovations but there exists very little evidence that shows the arena is over 50 years old. He explains further that the narthex that was built during renovation allows natural light to come in. The narthex makes it a great place to wait inside, especially on cold winter evenings. Some things cannot be expressed in words you have to see them for yourself. Feel that warm natural light by getting yourselves Blue Cross Arena tickets for the sports events. The average Blue Cross Arena Tickets price will cost you between $42 and $224, if you are looking for the cheapest seats then catch the event being held at the Blue Cross Arena, Rochester on 20/04/2019. The average ticket will cost you the highest on 04/05/2019 at the Blue Cross Arena, Rochester. Minimum get in price is for Blue Cross Arena Tickets is $33 for the event being held at the Blue Cross Arena, Rochester on 20/04/2019 , there are some venues that have a much higher get in price, for instance the cheapest seats at the Blue Cross Arena, Rochester on 04/05/2019 will set you back $91. When do blue choice arena tickets go on sale? How can I book american idol 2019 blue cross arena tickets? I am hoping to get 2-3 discount tickets blue cross arena. Are they available? Do you feature ticket master blue cross arena tickets? Yes, they are! Check our inventory of premium Blue Cross Arena tickets, book them at discounted prices and avail our discount offer! We feature tickets from the trusted brokers of Ticket Network, hence you can shop here with complete confidence. You can book these tickets online through Ticket Luck. The Blue Cross Arena tickets are now up for grabs.